When thinking of how we want to spend our summer holidays, most of us think of travel abroad. Additionally, often, when on holiday, we try to fit as many things into our itineraries as possible racing around trying to see and do everything. By the end of it, we need a holiday after our holiday! However, for a truly relaxing escape, and with plenty of summer sun left, the answer may be closer than you think. For body and mind restoration, there's no better medicine than nature. If you're looking to escape for a weekend, spending time in the forest has many proven benefits. Whether you're running, hiking, walking the dog, taking photographs, reading a book, or simply sitting, being with nature does wonders for our body and mind. Studies have shown that even brief trips to urban environments including a local park can relieve stress and help recalibrate our mind and body. In an article that appeared on the BBC website, Lucy McRobert, campaigns manager for The Wildlife Trusts in the UK, discusses a study between The University of Derby and The Wildlife Trusts whereby 18,500 were asked to engage with nature every day for a month. The results showed that people who reported their health as "excellent" increased by 30%. For a more detailed description on these benefits and more, see this Business Insider post. At Ferratum, we are proud of our Finnish roots. Finland is well known for its breath-taking forests, lakes and its peoples' connection to nature. According to the Finnish Forest Association, forests cover 75 percent of Finland’s land area. In fact, for every Finn, there is around 4.2 hectares of forest. Surveying Finland's Nordic neighbours, it was reported that in 2015 forests covered 68.92% of Sweden's land area, i33.33% of Norway's land area, and 14.49% of Denmark's land area. Throughout history, forests have played an important role in the lives of Nordic people so much so that there is a law stating that every person has the right to enjoy nature. 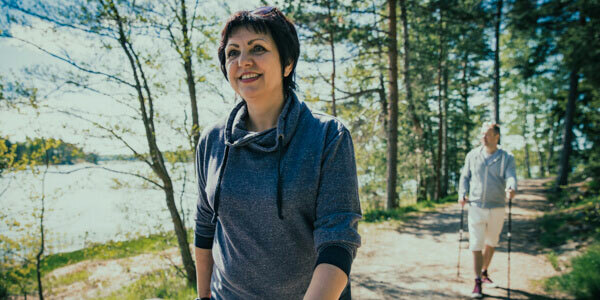 Finland's legal concept of everyman's right gives everyone the chance to enjoy outdoor pursuits, and the freedom of the country's vast forests and fells, and many lakes and rivers, with few restrictions. Of course, it's not just people in the Nordics who understand the calming benefits of the forest. In Japan, they practice what is called forest bathing or Shinrin-yoku which has been proven to reduce stress, boost immunity, lower- blood pressure, and increase wellbeing. The term Forest bathing was coined during the 1980s and is an act where a person is simply present with the forest. There is no focus on physical activity; the goal is to simply relax and “soak up” the atmosphere of being in the forest. So, next time you feel you need a holiday to relax, head for the trees. Thank you for your interest and hope to see you soon as a Ferratumbank customer!